Cirlock adds a high visibility line of scissor style lockout hasps to its wide range of lockout/ tagout equipment. 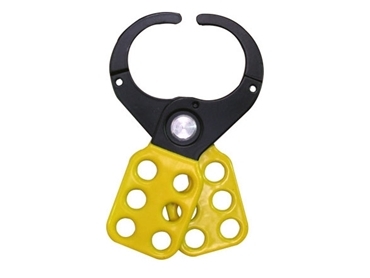 Cirlock’s lockout hasps are made from hard electro coated steel and come with a bright yellow poly coating for high visibility. SLH lockout hasps from Cirlock are essential tools when locking out hazardous energy sources, enabling several workers to place personal locks on lockout points. The high visibility lockout hasps are available with 25mm (SLH-40) or 38mm (SLH-41) jaw openings. Provision for up to 6 padlocks with up to 9mm shackle has been made. The lockout hasps are available in a variety of types and sizes.